Purchase our cutting-edge cloud-based remote monitoring software and start monitoring your Android device today! Your purchase entitles you to free minor upgrades for as long as you use the software. 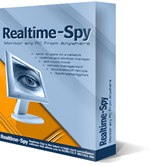 The latest version of Realtime-Spy is always available for download from our website.